Igna Sans is a contemporary typeface created by Daniel Peralta and published by Latinotype which is available in 7 weights (from XLight to Black) and italics, alternative glyphs, over 400 character set and almost 210 languages support. 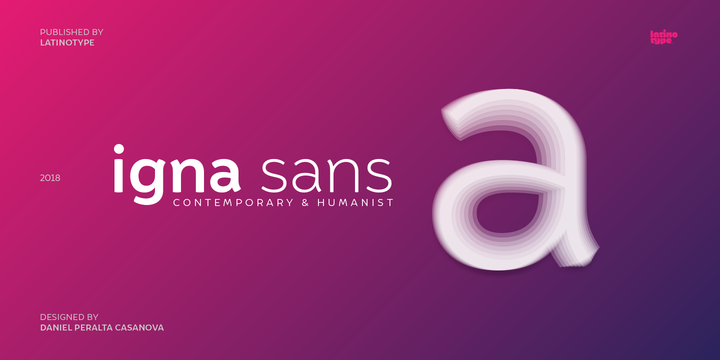 With a humanist touch is perfect for logo, display, headline, bfranding etc. Enjoy! Price: starting from $29,00 for one font to $169,00 for all 14 fonts. A font description published on Monday, March 26th, 2018 in Daniel Peralta, Fonts, Latinotype by Alexandra that has 1,792 views. Try WhatFontIs, the best font finder.